Gemma from Compass Muscle Therapy approached us at Team Locals Media to get a logo designed for her Southsea-based sport injury clinic. The first thing I did was hone in on the ‘O’ in ‘COMPASS’, building the shape of the eponymous wayfinding tool into it before trying out compasses constructed from lotus leaves. These initial concepts weren’t steps towards the end goal — merely practices to get a feel for the business name. 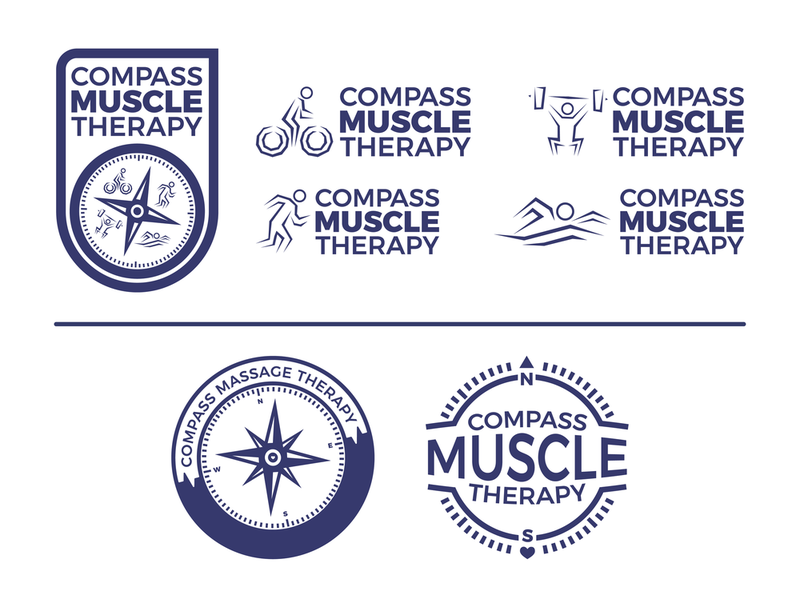 The holistic theme definitely wouldn’t tie in with Compass Muscle Therapy’s mission. I rolled with the Proxima Nova-esque typeface Montserrat for its blend of charming shapeliness and confident spacing — it rests at the crossroads of elegance and sturdiness. Ideal for Compass, a company focused on recovery and relaxation following tough sporting activities. Representing something as diverse as sport in a single icon can prove tricky, and the same goes for a subject as abstract as massage. One of my all-time favorite sports-related designs is Lance Wyman’s branding for the 1968 Mexico Olympics. Nothing will ever come close to even brushing the absolute perfection of Wyman’s Olympic branding. Seriously. It’s not even branding, it’s a whole damn language. Wyman was 29 when he entered the Olympic design ring, and he wound up working with Peter Murdoch, an expert in signage and semiotics (the study of signage, symbols, and how they’re used in infinite contexts), plus architect Eduardo Terrazas, publication designer Beatrice Trueblood, and a whole host of other awesome people. Now, I’m not designing an entire internationally-recognized design language, of course! But there’s a lot to learn from Wyman’s approach to his iconic project. Namely, how different elements in logos can interact and unfurl into individual pieces of design. That’s the next step I took: figuring out how to include elements in the logo that would be strong enough by themselves, while working together and remaining relevant within a locked-in logo. One of the best ways to ensure a logo’s elements work together is to recycle stuff within the design. In this case, I constructed sporting figures using the shapes of the compass points. Deciding which sports to represent was key. I whittled the four figures down to a runner (sans equipment, cardio, land), a weightlifter (equipment, resistance, land), a cyclist (equipment, cardio, land), and a swimmer (sans equipment, cardio, water). Sports pictograms are another core aspect of Olympic design language systems, and often reflect the culture of the host city, with aesthetics borrowed from the main event’s logo. I did try constructing the sporting figures from waves, what with Portsmouth being an island city, but it didn’t come out too nicely — the compass is a nice nod to our nautical heritage, though. 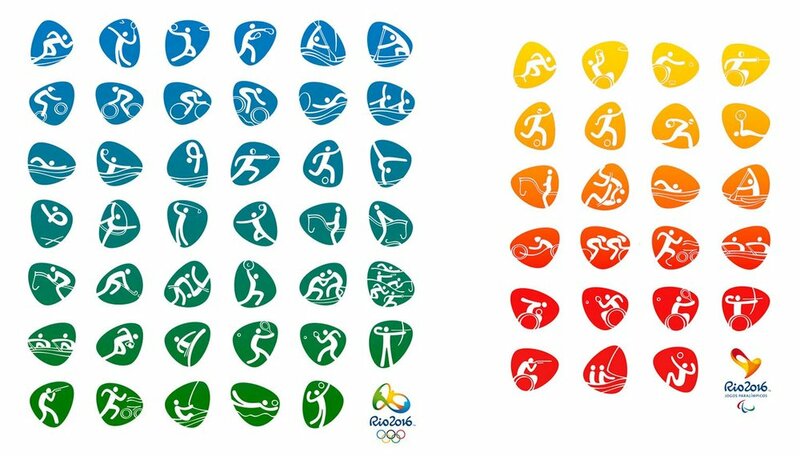 One of the absolute best sets of Olympic pictograms, in my eyes at least, is the most recent: Rio de Janeiro, in 2016. They all clearly belong together, but every single icon breathes differently. Anyway, I’ll stop myself there before I start sounding too much like an English teacher analyzing Shakespeare. Above the bar was considered finished. That shield lock-in is a strong logo. The shield feels like a sports team’s crest, the figures directly reference various sports, the compass is present, and the top-right corner of the shield is pointed, roughly following through with the direction of the compass. It’s good, though a touch tall, perhaps. Below the bar are two rough concepts. The one on the right was abandoned — the north-facing arrow and south-facing heart were nice touches, especially considering it nods to a love for the southern region where Compass are based. But we ultimately decided to incorporate the sporting pictograms into the bottom-left circular logo, and follow that route. The dividing lines on either side of the outer ring represent heart rate. I cut the N, E, S, and W direction lettering out and used a four-pronged compass rather than the design with eight points. Gotta keep it simple and remove the unnecessary flack.